The VEPP Web site will be on-line and accessible to college and university instructors by early 2010. 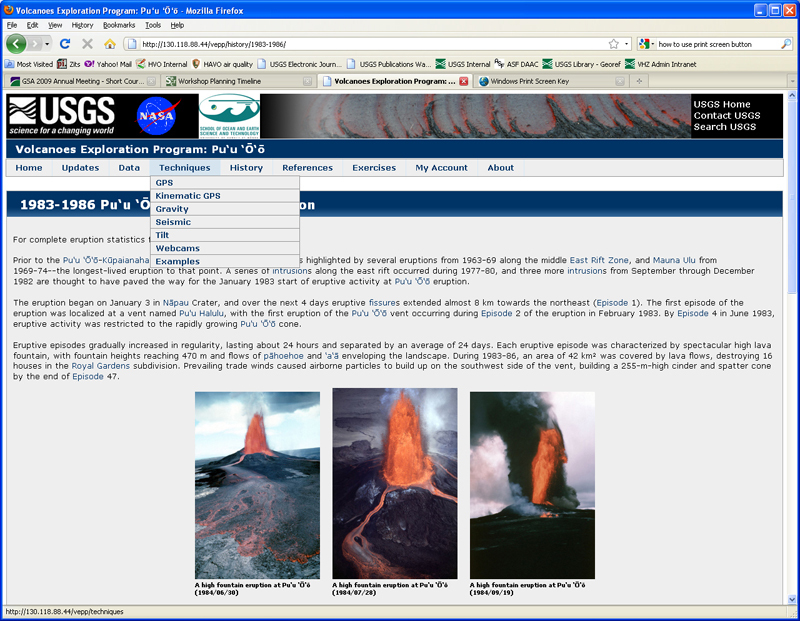 The site is organized to provide background information on volcano monitoring employed to track activity at the Pu`u `O`o eruptive vent on Kilauea Volcano, a history of the Pu`u `O`o-Kupaianaha eruption (1983-present), reference materials (glossary, downloadable scientific publications, etc. ), daily activity updates, and access to data collected form Pu`u `O`o. 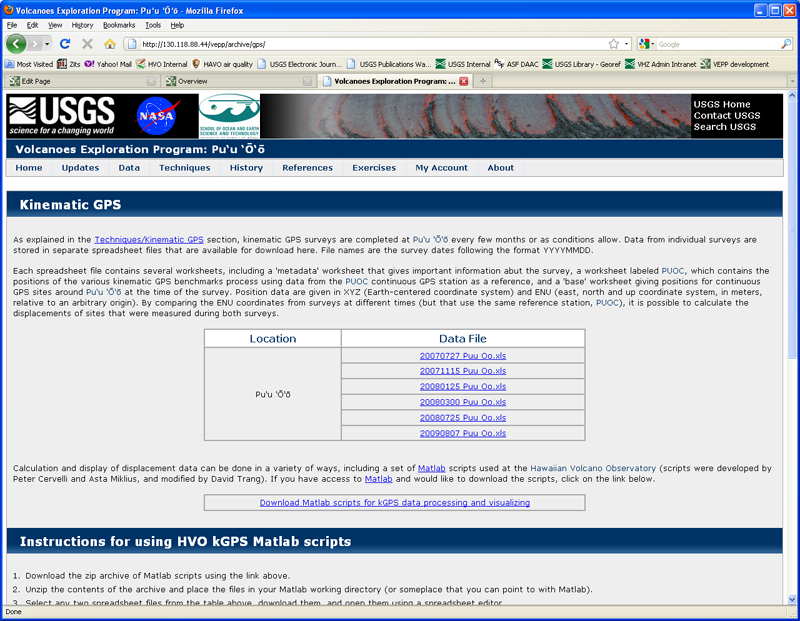 The address for this website is: https://vepp.wr.usgs.gov/, but requires password access. Contact mpoland at usgs.gov for access. The screen captures below provide a sense of the Web site look and feel, and the information that is available. 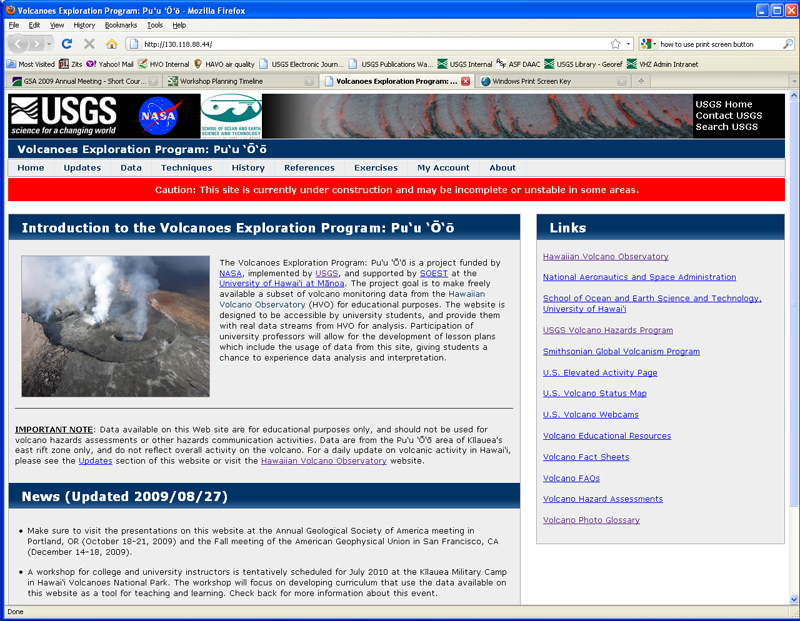 The front page of the VEPP Web site includes information about the VEPP project, links to other on-line volcano resources, and updates concerning the Web site or monitoring of and activity at the Pu`u `O`o eruptive vent. The eruptive history of the Pu`u `O`o vent is divided into 5 time periods: 1) 1983-1986 (high fountains from Pu`u `O`o), 2) 1986-1992 (continuous lava effusion from the Kupaianaha vent), 3) 1992-1997 (pre-collapse flank eruptions from Pu`u `O`o), 4) 1997-2007 (post-collapse flank eruptions from Pu`u `O`o, and 5) 2007-present (lava effusion from the TEB vent). This screen capture shows a portion of the 1983-1986 history (a drop-down menu is also active). All of the volcano monitoring techniques employed at Pu`u `O`o are described, including tilt, GPS, gravity, seismic, and webcams. The description of each technique includes background, photographs, use at Pu`u `O`o, example data, and references. 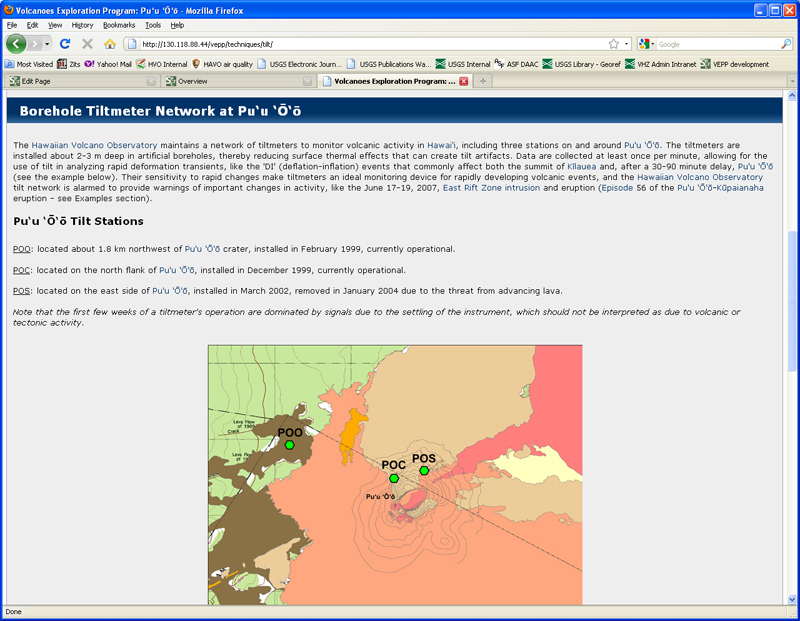 The screen capture above shows the portion of the tilt page that introduces the tilt network at Pu`u `O`o. 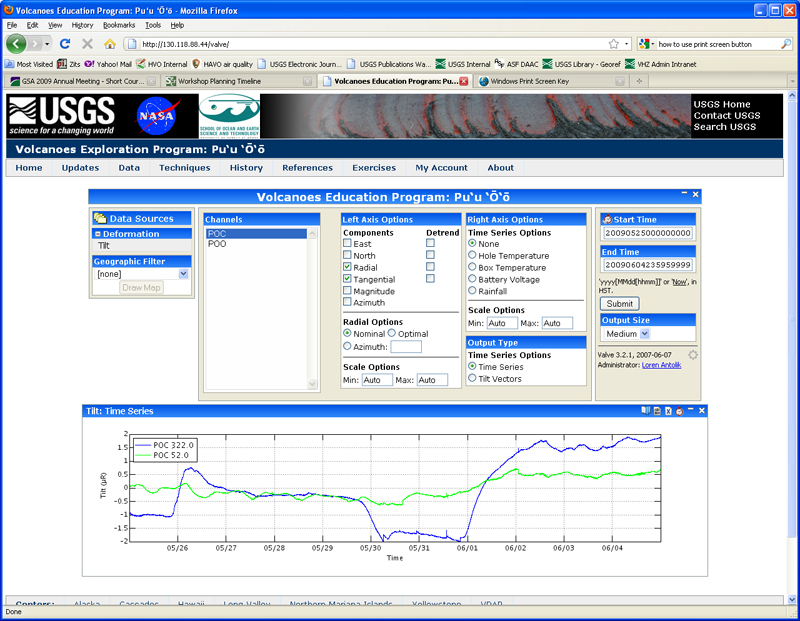 Time-series data (including tilt, continuous GPS, gravity, and seismic) can be accessed via the interface shown above, which allows users to choose data types, stations, components, and timespans. The plot shown is tilt from the POC tiltmeter (located on the north flank of Pu`u `O`o) that is radial (blue) and tangential (green) to Pu`u `O`o crater, and spans May 25, 2009 to June 5, 2009. 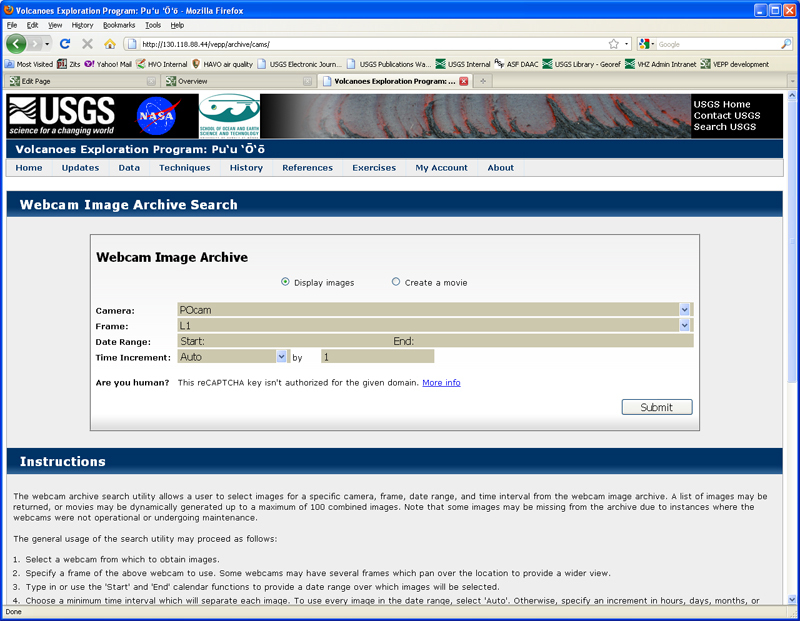 Using the VEPP Web site, users can query the large archive of webcam imagery from Pu`u `O`o, using it to construct time-lapse movies or retrieve up to 100 frames at a time. The screen capture above shows the interface for searching the Pu`u `O`o webcam database. Each time kinematic GPS data are collected from on and around Pu`u `O`o, they are posted to the VEPP Web site for download. The data can then be used with a set of downloadable Matlab tools for visualization, or imported into a user-specific program for display, analysis, and even modeling.